TV Stand Ideas – Technologies developments now reach an era when we see flat-screen TVs replace tube ones. These said flat screens can be mounted on the wall with adjustable height according to their owner. However, the existence of TV stands still demanded by consumers because they see them not only as a place for their TVs but also as connecting space between devices and media. 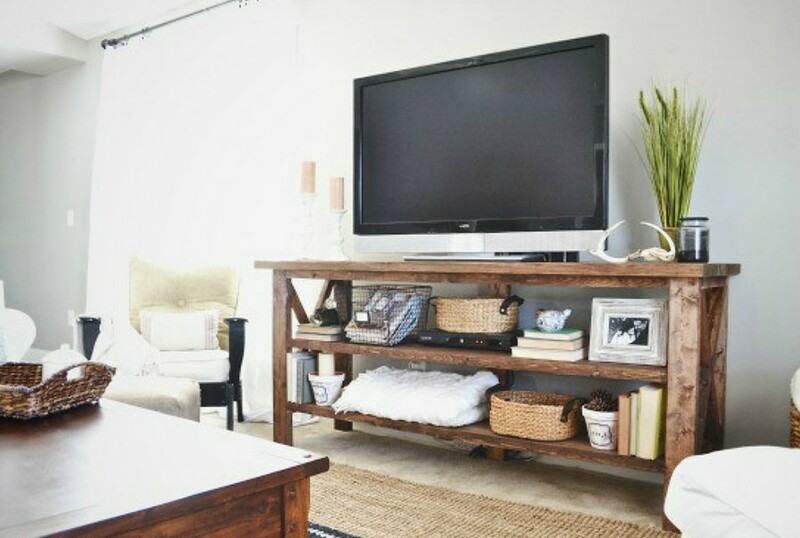 Therefore, today’s article comes up with TV stand ideas in several styles including a farmhouse, rustic, modern, and retro. But before you go through the ideas, please take a note of some things before having a TV stand. TV stands come in various sizes since the needs to place the TV is also diverse. There are TV stands to put in the living rooms, bedrooms, or even much smaller rooms. So knowing the length and width measurement of your space beforehand will absolutely help you. TV stands also come in different height so that you can get the best angle to watch from couch or bed. Nevertheless, having TV stands doesn’t always mean that you have to buy them. Rather, you can build one for your own convenience. By making one, you are able to freely decide the size according to the needs of your space. Otherwise, you can ask for experienced woodworker’s help if you feel you don’t have enough skill to make a TV stand. All in all, whether you decide to just buy one, or build one with the help of professional woodworker’s help, or build one on your own, there are advantages and disadvantages for each decision; the price, for instance. Depends on what type of wood it was made from, hardware, and the finishing, the price can be either an advantage or disadvantage. So, plan everything well from the very beginning to get the best result in accordance with what you expect. Now, you can go through the ideas of TV stands presented in this article. 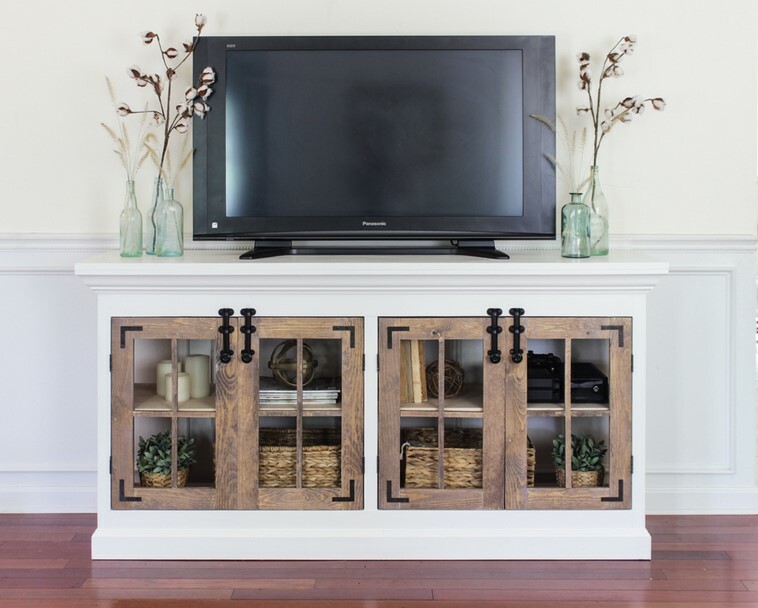 The media cabinet seen in the picture has a slight rustic farmhouse look. But you can add some hardware and color to have the touch of modern if you like. It is provided with double shelves so that you can store many things in it. And because it’s a TV stand, the important thing you should check is how sturdy the top part to put your TV on. But since it’s not for sale anywhere, you have to build one in order to have a TV stand like this. There are 16 steps of how to make it, from building both sides of the frame to optionally add glass panes. The complete plan is explained in Build Something, from diagrams, instructions, the list of tools, materials, and parts/cuts, to a visual tutorial in the form of video. Those are explained in order for you to have the product as similar as possible with the one shown in the picture. 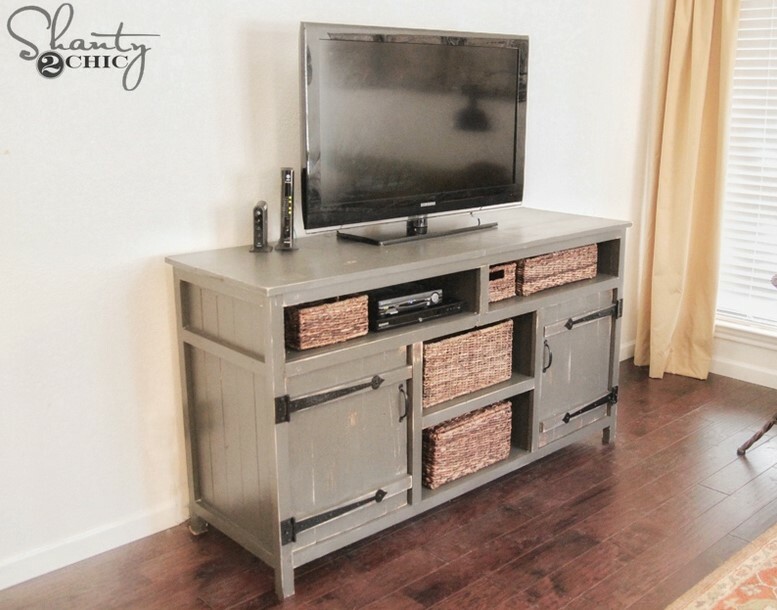 If point number one shows a TV stand that has a slightly rustic look, then this time shows the real rustic TV stand. It is designed to have not only open shelving but closed shelving also. Though finished in rustic style, it has less distress. You are able to give it a complete brand new appearance if you see it deserves to. This project starts from building the side frames and ends with painting the whole set with colors that are so rustic. You can go to “Shanty 2 Chic” to see the whole free plans to make one yourself, from the diagrams, photos, the list of tools, and materials, to a video that was taken when it is made. 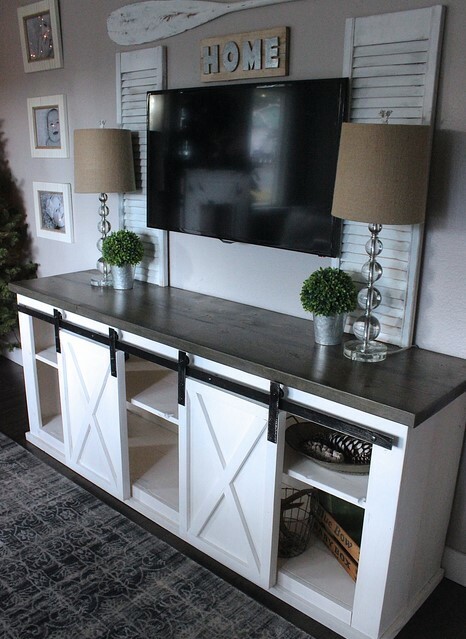 This TV stand ideas that includes small sliding doors is inspired by the barn. You know, the X seen in front of the doors remind you of the ones seen at the barn. The sliding doors give you easy access to open the closed shelving. Go to Ana White to see diagrams, color photos, and the building instruction steps. They are explained for free. Before making this project, firstly you are generally instructed to read through the complete plan and even the comments. Works on a clean level surface, use straight boards, pre-drill holes before installing the screws, wipe the exceeding glue, are other common instructions to follow. This TV stand is pretty simple. It has no door whatsoever, but it still looks proper for a TV stand. As seen in the picture, there are two shelves included and also details like the X frames on both sides and planks. The shelves and details are what make it look great as a furniture piece that is able to use until a few years from now. This farmhouse style TV console project starts with working the base and top framing and ends with painting the complete set. Remodelholic has the list of tools, materials, and cuts, as well as the directions of how to make it, diagrams, and photos. They are given freely with the expectation that it can help you and other rebuilders along the way. This is another set of TV stand from Ana White. 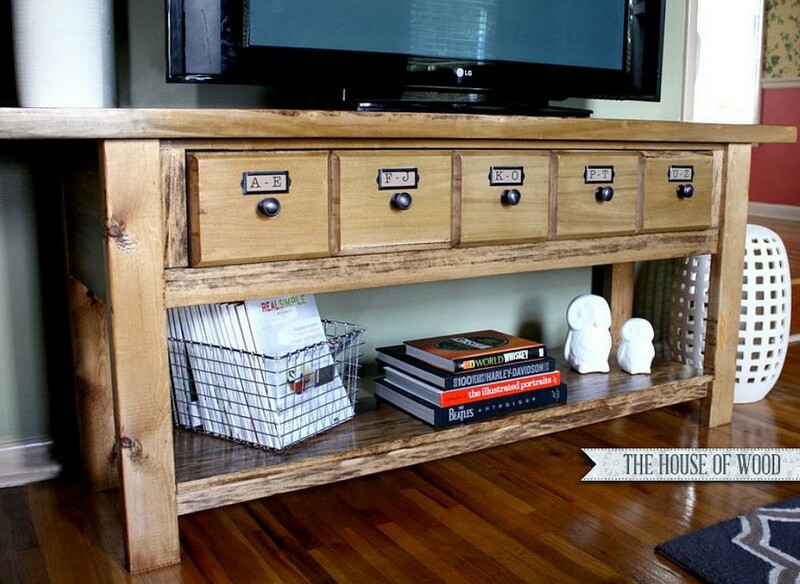 It gets the look of rustic which inspired by a console by Pottery Barn. It’s absolutely simple and affordable at the same time. To make this project you have to follow all 6 steps, from building frames to adding the top. The complete plans explained by Ana White include the list of materials, tools, and cuts, as well as detailed dimensions in a diagram, and the instructions. Having TV in the center of the room is not compulsory. You can place it in the corner also with style. And this corner TV stand ideas will surely help you with that. If you look at the picture carefully, you find out that the front and back side doesn’t have the same shape. It is because the back side is designed in such a way that fits your corner part of the room. This TV stand also made with two long shelves so that you can display your favorite things as decoration or organize your favorite books and magazines. Add a couch or similar comfortable seating in front of the TV stand and you will have a nice small cozy reading spot of your own. This project is explained completely by Rogue Engineer with the list of materials, tools, and cuts. Not to mention the dimensions shown in diagram and how to build this project are also included. You have two references of corner TV stand ideas with this other example from Ana White. This one will go really well in a bedroom or in a large room with a clumsy layout as it is tall. To make this tall TV stand project, you need to follow all 10 steps of the instruction, from building the top shelves for the media controllers to give the finishing. Go to Ana White for the complete plan. Also in the package are the lists of materials, cuts, and tools as well as dimensions explained in the diagram. 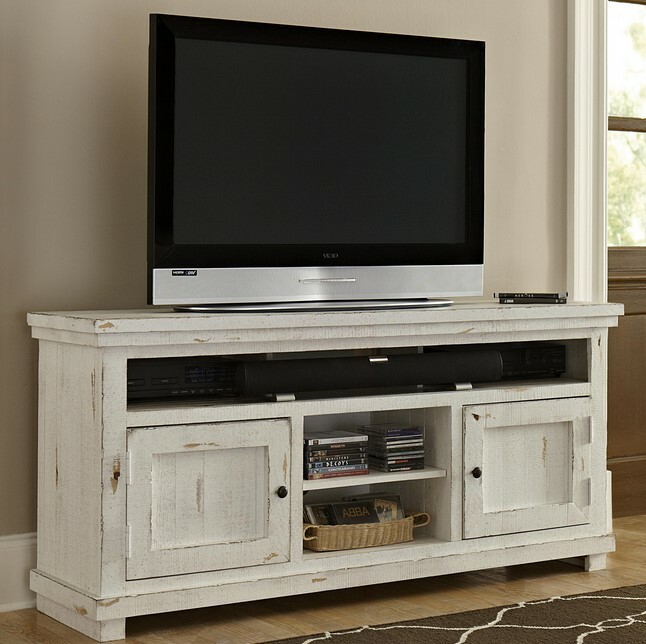 If you look for some industrial and rustic blend in TV stand, this is the best answer for you. 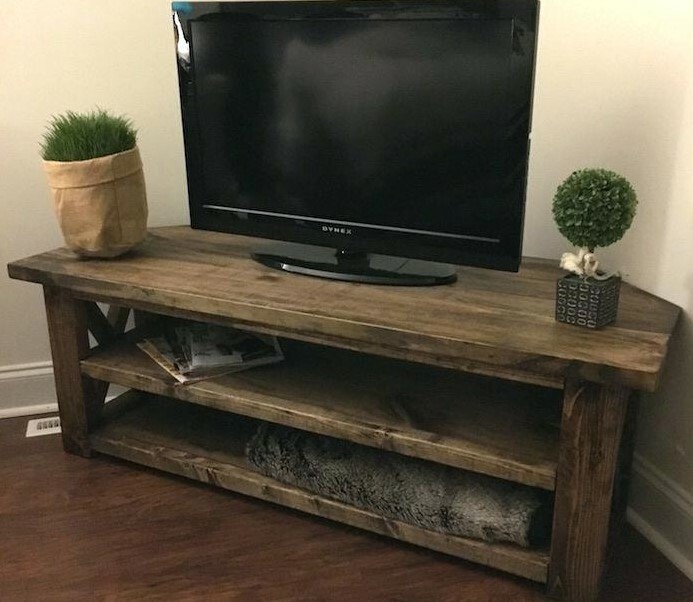 Built with dark wood stained for the TV holder and galvanized pipes for the legs, nothing is simpler than this item from Homedit. 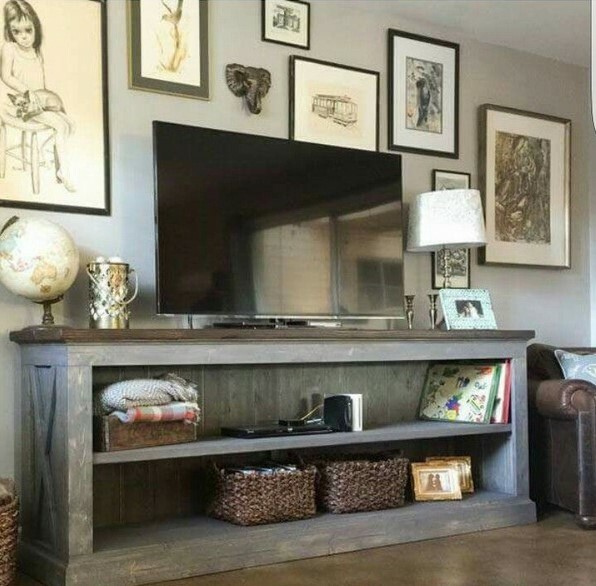 Besides rustic and industrial, you can also get the look of modern from this TV stand using thinner wood. 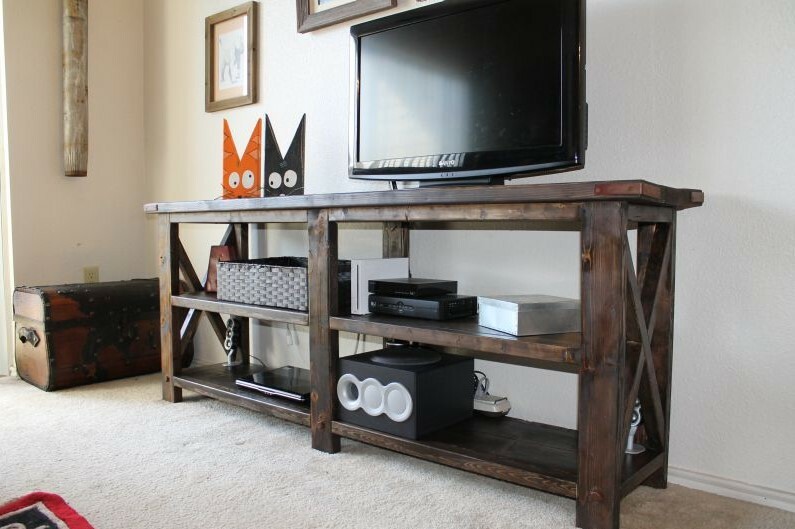 Though simple, this DIY TV stand has multi-functions and can be placed anywhere in your home. Bonus tips: when it comes to select boards, pick the sturdy ones enough to hold your TV weight and therefore durable as it can’t be easily bent. This project costs you with no more than USD 63 in total. 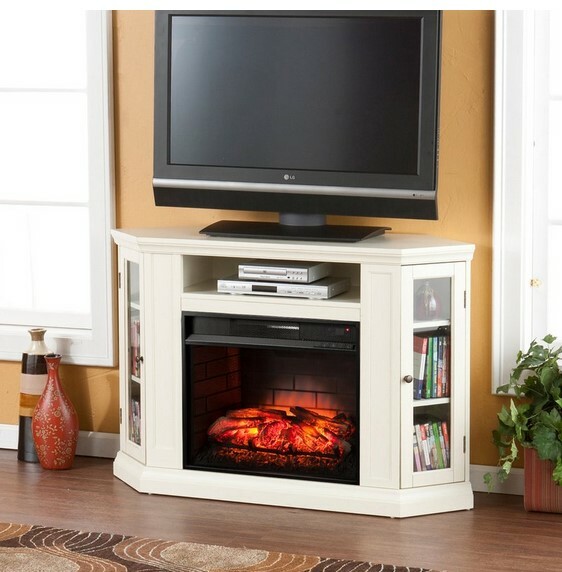 For some stylish TV stand, you can also have it combined optionally with an electric fireplace. There’s this item which is available for purchase online in Wayfair. It is sold for USD485. It’s under the trade name of Dunminning Corner TV Stand with Fireplace by Alcott Hill and comes with remote control for your convenience. You can adjust timer, thermostat, flames, and logs easily using the said remote control. In times the power is off, flames and logs turn down slowly at the same time. This TV stand will be really helpful during winter. And will be even greater with some room upgrading, such as a fringe-trimmed rug, coffee table, pillows, and a few fleece blankets. It’s finished with a solid manufactured wood which perfects for holding your flat screen TV. Meanwhile, the side cabinets and the open shelf can be used to store your DVD collections and DVD player. The advantage of making your own TV stand is that you can customize it to your heart content, like the one in the picture. Made with plywood that is simply cut into narrow strips, you can have slots to store books, DVD players, DVDs, and remote TV. This project will cost you no more than USD 40. It is true indeed that to have this said TV stand, you need a lot more effort, especially in cutting the plywood and stacking them as well as making the legs. But it’s worth the effort. By making this, you will get a midcentury media console as the result. If you have some unused old pallet that piling up somewhere around your house, now it’s time to transform them into something useful like a funky TV stand which completed with a glass-topped display case. You can sand the old pallet so that it has a fine touchable surface. Otherwise, let them the way they are with their original texture, character, and charm. But please take note, it is recommended to sand them if you have kids running around touching everything. It’s safer that way and you can save you all a trouble. 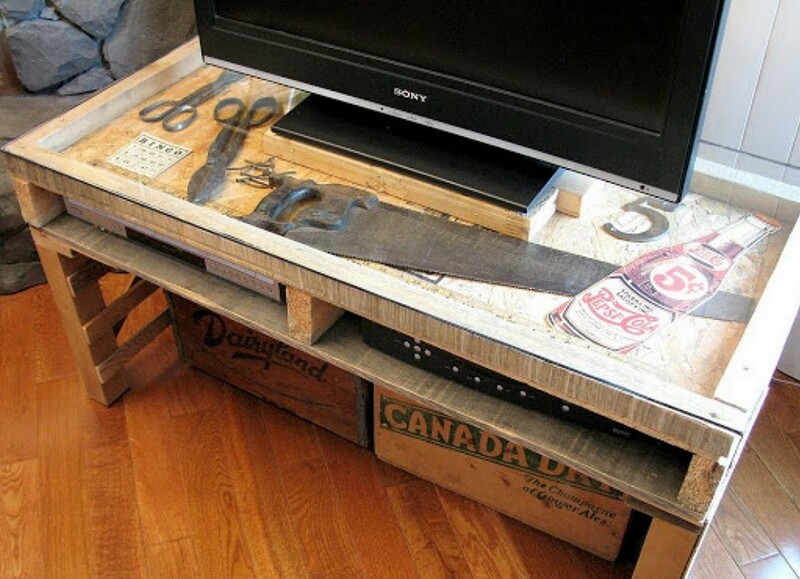 Your old dresser can be repurposed into some functional and beautiful TV stand. Have it sanded and repainted with a different color from the original one to get the new look. The drawers can be used to organize the remotes, video games, or other small items. In only a few hours, you can make this kind of functional and beautiful furniture that can stage your TV as well as store your books, artworks, knick-knacks, and other things to make them easy to reach. Including wood and hardware, it is estimated to costs you USD 100 at the very least. It will be perfect to accentuate your room with additional wood. 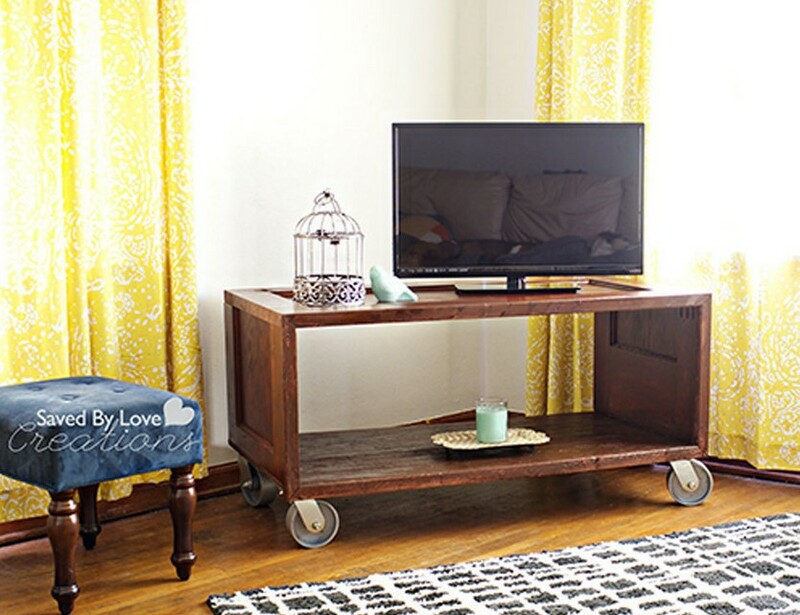 Believe us when we tell you that this one TV stand is made from an old door. You may find an old door anywhere, be it at an estate sale, in a trash bin, or on the curb. But with cleverness, you can magically turn the unused door into a fantastic stand for your TV. To make it moveable easily, attach some casters or shopping-cart wheels where the legs of a table are supposed to be. The picture shows you an example of how the result is. There’s a reason why this TV stand is named as a copycat. It is because this item is the resemblance of wooden entertainment centers that are available for purchase at home stores. And you know what’s next; it is expensive. So, why don’t you build the similar version of your own to save you some cash? 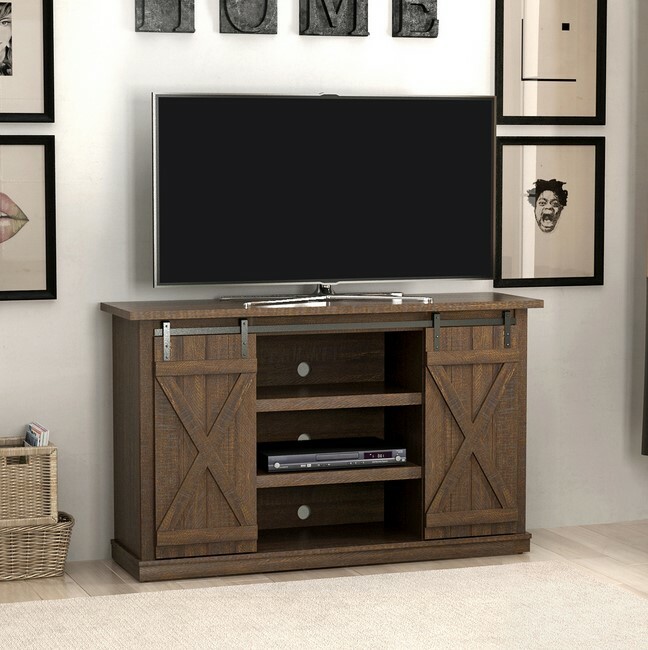 This is a practical and stylish way to stage your television set with the thoughtful design on the details and hidden storage. A TV stands with old and rustic looks, contrasted with the room theme. This is one of unique tv stands ideas that you can try. And, unfortunately, you can’t find it sold freely on the store. 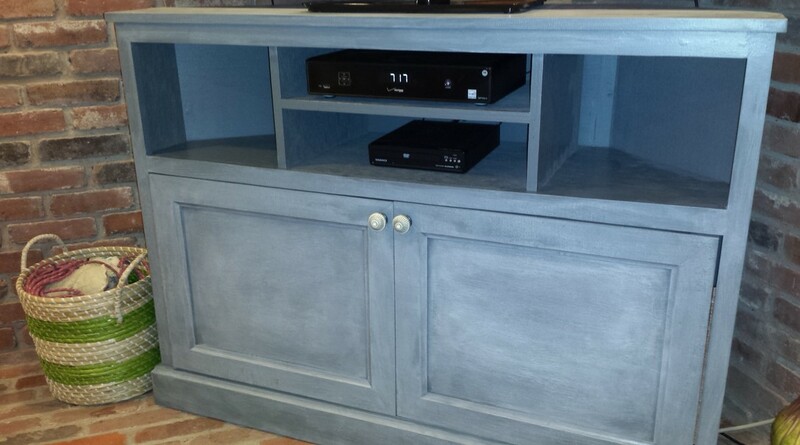 This one is handmade or DIY type TV stands. Therefore, if you have hobby to create something or you are creative type person, this is good choice for you. It was made of old wood that you can easily find on the used store. Or, some of home appliances and material store provide this kind of rustic type of wood, lately. So, go to their website to find out and visit their store to buy the wood. Because this is DIY type TV stands, you also can design it like what you want. So, it’s not only like what you see above. You can add more shelves or add its size. Just match it with your imagination and what you need. The color can also be made separately. For example, if you can’t find that kind of original rustic wooden color, you can make it by yourself. What you need is the light and dark tone color. The light color is for the base and dark for the accent. What you need to do is paint the wood with light color, in this case white. Then, use fabric to add the dark color as the accent. Wipe it slightly, to give it the rustic and chic style color. It said that this method is useful to create Brooklyn style rustic wood color. Basically, you can’t only use the white color as the base. As long the base is the lighter from any color tone and the accent is darker color from similar color tone. So, it’s your freedom to create any looks that you want with this kind of TV stand. Other than color, you also can pay more attention to the cabinet knob. This is actually important part that can affect your TV stand appearance. The whole TV stands looks classic. But, if you can use modern style cabinet knob, it will looks different and more modern. And, the good thing about this TV stand design is you can place it in any type of room. If you place it in classic theme room, it will blend really well. However, if you use it in minimalist and modern style room, it will become one of the best focus points of the room. This is indeed good idea you can choose. However, if you don’t like to be bothered with creating your own TV stands, this isn’t good choice for you. But, you can solve it with used TV stands and modify it a little bit. 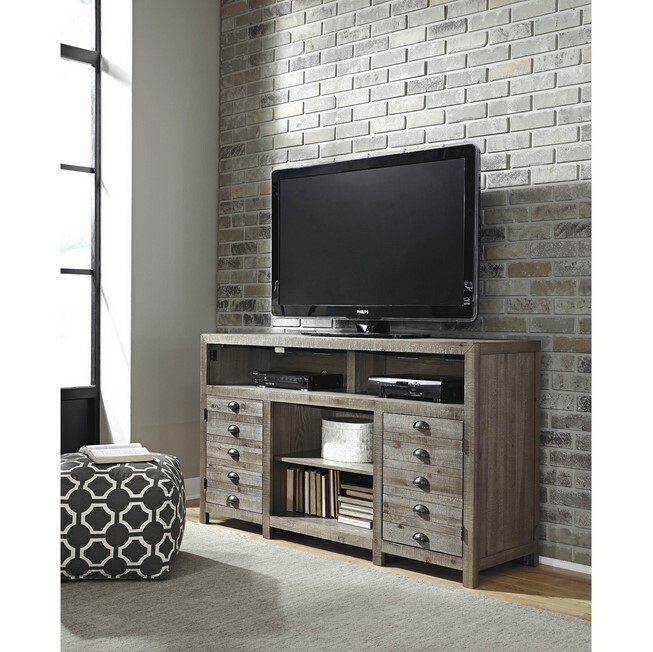 The rustic color of this TV stands is suitable with the wall texture and its color type. The bare bricks type wall can boost the appearance of the TV stands. Although the color tone is close each other, but this combination is definitely good thing you can try. Actually, there was a time when the combination between two strong patterned object produce good appearance. This one is apparently tried to recreate that kind of combination. And, we can say that it succeed to create the appearance that they want on this tv stands ideas. The wood type of this TV stand is another good point of it. They let its natural wooden color which gives it nice touch of nature in your room. So, what you need to do here is adding right decoration that you can place on it along with your TV. We recommend the green type decoration or plant in this case. Green decoration will boost its nature power. More than that, because it uses natural wooden color, it almost matches with any plant decoration that you use. For the multi-function feature, we can see it on it. There are many shelves and space, where you can used to place many things in it. Books and DVD or CD are some of them. Of course, the space for their player is also available, which make it good TV stands for your room. Because of the multi-function feature, we also can say that this TV stands is good choice, if you have minimalist or modern style room. It’s suitable with the space saving concept that most of modern room style has. Of course, you also can put it on other room. The many spaces that you can find in this TV stands is actually good thing you can have for keep your room tidy. So, you can use it not only for keeping something that related to your TV, like DVD and such. But, you also can use it to keep other. 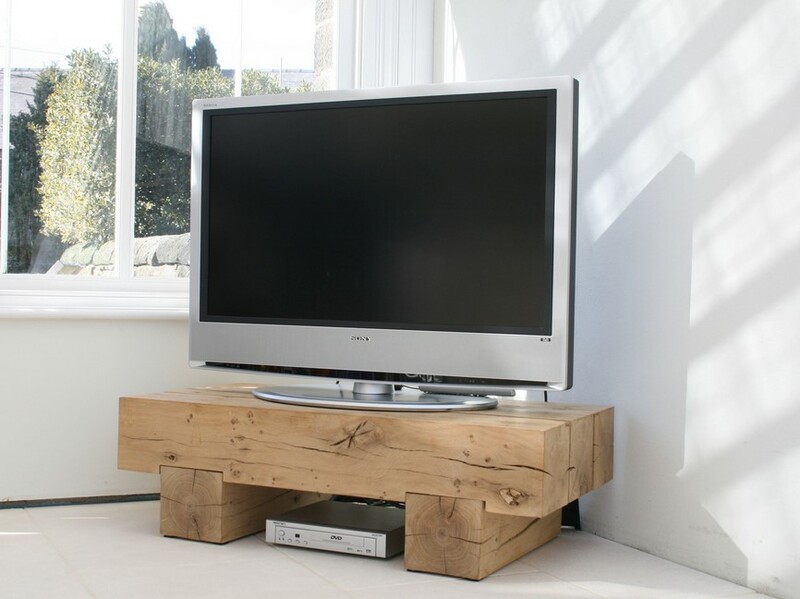 With its multi-function and unique design, you can eventually use it not only for TV stands. You also can use it for many other purposes. For example, you can use it as usual table and base to place your room decoration. This is one of good tv stands ideas choice for you who want more space in your room. Freedom is the main concept that we can see from this TV stand. With the sliding door, basically, you can create any room that you like on this TV stands for your need. It’s not only the space. The style also can change like what you want. For example, you can slide the door to the far right and left side. This will create the main focus point in the middle, where you can place any decoration in it. Actually, the sliding door is also very useful to create different appearances. For example, you can place the plant on the right and left space and book on the middle. So, just slide the door to any side and you can shows different type of decoration. More than that, the sliding door gives this TV stand a farm and village nuance. It’s good choice, if you want to add some natural nuance in your room. Just make sure you place it on the right place on your room, and it will become great decoration you can have. On the other hand, the sliding door is also very useful when you try to watch TV, using DVD player or looking for DVD that you place on it. It will be much faster, to change between function or needs that you want with this kind of TV stand design. One more interesting point is the design. It doesn’t have too much accent. We can say it’s plain. For you who are looking for something interesting, this one isn’t good choice for you. But, the plainness it has can give you more freedom to create any looks that you want. You can find this TV stands on online store. To make it looks interesting, you can add any picture or pattern that you want on it. The plain white can be changed into floral pattern if you want. Like the freedom that its sliding door offered, you also have freedom to change its looks. But, from our point of view, if you also want to let it like this, that wouldn’t be a matter. This standard design also is suitable with any contemporary room design. So, do not worry, when you don’t want to change its design. This is one of fabulous TV stands you can find. There are two main points that we can point out from this TV stands. First is the elegant and classic style. And, the other one is the farmhouse type design. The elegant and classic style came from the dark wood color that it used. More than that, the shiny finish that they used also adds more beauty on this TV stands. But, they don’t remove or paint it, so the natural wooden texture still can be seen on it. 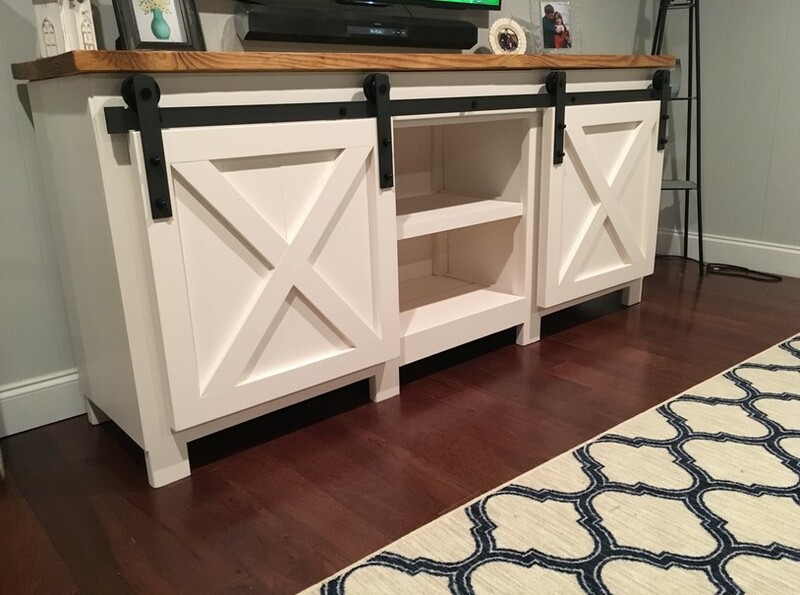 The farmhouse type design can be seen on the sliding door type that installed in this TV stands. You can find this type of door design on the door on barn. The cross or X shape on the front side of the door is the most interesting part of this door. And, like other tv stands ideas, sliding door is always good choice for giving the owner more freedom to create space or looks that they want. This TV stands idea is also using the similar concept. You have freedom to do that. The main problem on this kind of TV stands is the size and strength. The size for this TV stands isn’t too big. Therefore, even though you have more space and freedom to keep anything that you want, it still can’t be compared with other type TV stands. The strength is actually not a problem. But, if you compared with TV stands with supporting wood inside, this one is quite worrying. There is no supporting block inside for accommodating the space and freedom concept that it has. This could be problem, if you use big size TV. However, from what we looks, this TV stands won’t have problem for placing 40 inch and even bigger than that on it. So, we can say that the wood that they used for this TV stands is good quality one or wood with high durability, like teak or oak. More than that, you also can use this TV stands in different way. For example, you can use it as the place or cabinet to keep your DVD, CD, book and DVD player. And, if you are worried about TV, you can mount it on the wall just above this TV stands. That method will change the function of this TV stands. It won’t become the TV stands anymore, but table for placing your decoration. And, from the design that it has, we can say that you can use it for that without problem. We also love the metal plate as the rail to slide the door. The combination between natural pattern wood with metal, looks really great. It gives the contrast but beautiful appearance on it. And, with this type of appearance, you can place it in your modern room. Okay, we have to admit, this one is unique TV stands you can find. The rawness of this TV stand can be seen and felt easily. Like what you can see, it looks just like blocks of wood, piled up each other to create desk-like furniture to support your TV. Because of this rawness, this tv stands ideas is good choice, if you want to give something different on your modern style room. However, this TV stand has been finished, so we can say that it is safer to place on your room, without worrying about it will be damaged. The only flaw of this TV stand is the space available for keeping your stuff. There is only one area under the TV stands where you can place your player. Of course, because your player will contact with your floor directly, you may need to place something under it to protect it. From the design, we also can say that this TV stand also can be used for other purpose, such as coffee table. So, for example, if you don’t need it, you can still get it for that. Or, you also can use it to place your player on top of it, while you wall-mount the TV. Having a TV stand is very helpful even if you have a flat screen TV that can be assembled by mounting it on the wall. People still need the existence of TV stand to store more than just their TV alone. And apparently, besides buying one, you can also build a TV stand on your own. 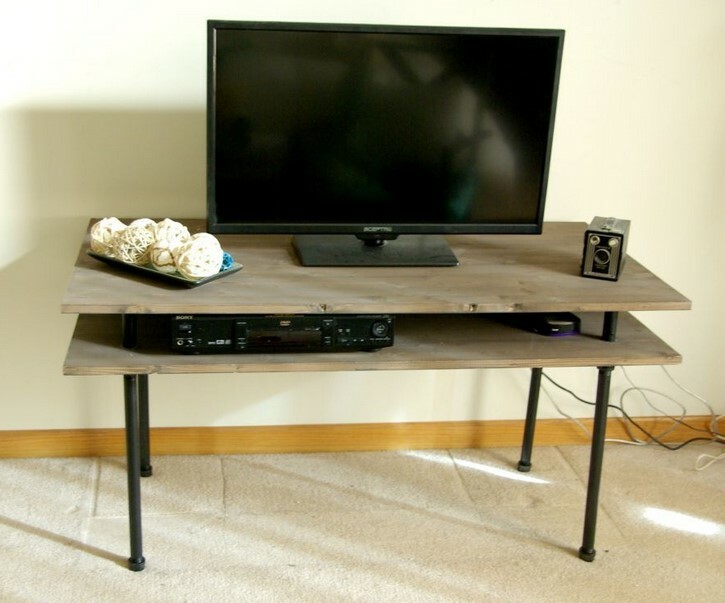 With the help of tutorial you can find anywhere online, like this article of TV stand ideas aims, you can customize and adjust your own furniture based on your needs. All you have to do is follow the instructions carefully and don’t forget to ask for advices from some experts.